It may be her first time in Alice Springs, but Jennifer Evans from Atlanta, Georgia, has been presented with a special gift by Charles Darwin University for being the 20,000th person to come to Australia as part of a cultural and educational travel program. Jennifer is among a group of approximately 30 travellers from the United States participating in the Australian-based Odyssey Travel group’s Elderhostel inbound cultural and educational travel program. 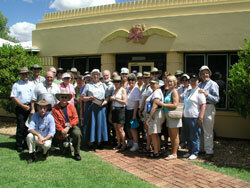 CDU and its predecessor Centralian College have been facilitating visits to Central Australian tourism attractions through the program for a decade and a half. 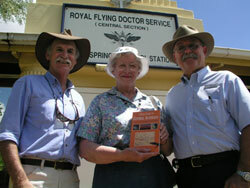 CDU’s Pro Vice-Chancellor for Community and Access, Don Zoellner presented Jennifer with a Field Guide to Central Australia while the group was visiting the Royal Flying Doctor Service in Alice Springs. He outlined the University's history and activities in the Norhern Territory, with a particular focus on how CDU is delivering to remote communities through the Mobile Adult Learning Units (MALU). Jennifer was born in Australia but moved to the United States as a young child and is has come to Central Australia for the first time on her 44th Elderhostel study trip. Odyssey Travel, based at the University of Wollongong and Elderhostel, a Boston-based company, are both not-for-profit organisations, whose aim it is to provide adventures in lifelong learning for older adults through special educational travel programs. CDU hosts twenty groups of 30-40 participants each year to Alice Springs and Uluru, where local experts present lectures and conduct field trips focussing on local history, arid zone environments, Aboriginal culture and art, astronomy and the cattle industry. Participants visit attractions including the Western MacDonnell National Park, Uluru-Kata Tjuta National Park, the Desert Park, School of the Air, Telegraph Station, Ooraminna Bush Camp and Olive Pink Botanic Garden. CDU's Educational Travel Program Co-ordinator Martin Ludgate says the program provides a valuable link between the University and the local tourism industry. Through these great partnerships, the program enables participants to really experience the Outback, learn about our desert environment and the lifestyle of Central Australians as well as gaining an insight into Aboriginal culture in our region,” he said. Odyssey Travel Executive Director Denis Simond said both Odyssey Travel and Elderhostel believe learning is a lifelong pursuit that opens minds and enriches lives. “Participants come from every walk of life to learn together, to exchange ideas, and to explore the world. The world is our classroom,” he said.